Sprinter Sacre: Still the force of old? That would have been a fairly quiet weekend…had it not been for the appearance of a certain Sprinter Sacre! OK the evidence is highly inconclusive at present and opinion is very much divided but Saturday’s 2nd place finish in the Clarence House Chase at Ascot was nowhere near a peak form Sprinter Sacre. But that is no surprise. This was his first start for 386 days. Indeed it was his first ‘competitive finish’ for 21 months (his 2013 Punchestown Festival victory was the last time we saw him complete a race prior to this run). Despite what anyone said he was always going to need this run to a certain extent. At the same time, however, there has to be a sense that his glory days are gone. The old sparkle, apart from a couple of fleeting moments, didn’t seem to be there. The aura just wasn’t quite shining as bright. We don’t really know, however, if that was down to the horse himself or whether Barry Geraghty wasn’t fully letting the horse shown his current hand and was simply letting him complete without getting into a slogging battle. With a horse like this (a superstar returning from a lengthy break) I’m always keen to oppose them until they prove to me that they still have the ability to win, still have that desire to compete at the top level and are still able to run right through the line and finish their race out in a normal fashion. Sprinter Sacre still has to prove all three to me. Grade One’s are not won by horses that are a former shadow of themselves and it is extremely difficult, if not impossible, to climb back to the top of the tree once you have fallen off. Sprinter Sacre now has to make that climb back to the top of the tree. He won’t get there, however, without a gun or two being pointed at his head. And that may well be the big sticking point. Trainer (and possibly even jockey) don’t seem to want to point even a spud gun at the horses head! In fact is Henderson willing to put a gun to any of his chasers heads? Yes, I couldn’t let this section drift past without backing up last weeks Nicky Henderson stats. If you cast your mind back to last Monday I informed you that Henderson was 3/47 (6% S/R) with his chasers since around the start of November. Since then he has had two more chasers hit the track. Both were beaten. Both were odds-on. The horses in question were the already talked about Sprinter Sacre and the Queen owned (Monarchy not Brian May and co.!) Close Touch, who was resoundingly thumped up at Haydock. Was Saturday as good as it gets for Sprinter Sacre or was that run merely a Cheltenham warm-up? I’ve always been a fan of Dodging Bullets but I was never fully convinced he had proper Grade One credentials locked away ready to be unleashed. Even after his impressive Tingle Creek victory in December I wasn’t convinced. After all a solitary Grade One victory doesn’t make you a solid Grade One player, in the same way a solitary Grand Slam victory in tennis doesn’t make you solid Grand Slam player or a single Major victory in golf doesn’t mark you down as a serious threat in all future Majors. One victory at the very top level can sometimes mean you simply took advantage of the situation (injury to others, below par performances from the top players, etc…) and you are never to repeat the trick again. Two victories at the top level of the game, however, forces people to take you seriously. And that’s what we must do now with Dodging Bullets. The thing with Dodging Bullets, however, is that he hasn’t, in the past, been a fan of the spring-time. In the racing game that brings about obvious problems! His October to January form is hard to crab – 111133111 – but if he is to prove to be a real top quality animal he needs to now do it in the February to April period, where he has a less eye-catching record of 22494675 (form of 494567 at the Cheltenham and Aintree Festivals – 5 of them in G1 contests). In all honesty that Clarence House Chase result has probably blown the Queen Mother Champion Chase wide open. 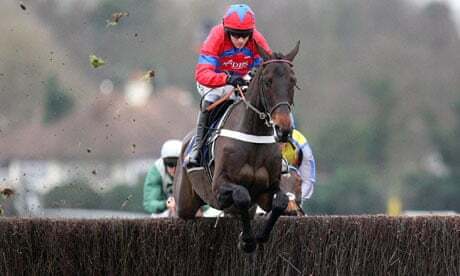 Sprinter Sacre (11/4) – Just recently returned from a serious health issue (and a number of minor issues thrown in) and no obvious signs on return that he is the force of old. Dodging Bullets (9/2) – As already mentioned he hasn’t been a lover of the spring-time in recent seasons. Sire De Grugy (9/2) – Yet to be seen this season due to injury. That three take out a large chunk of the market. If you can find a viable alternative amongst the rest of the field you are sure to be getting plenty bang for your buck. But that’s no surprise to be fair. He was beaten the only other time he met with heavy ground and I don’t think you can blame any horse for looking less than impressive on Haydock heavy in the face of a north-west sleet shower!! I’m neither a fan nor a knocker of the horse and he’s a horse I very much have an open mind on. I also have an extremely open mind on the Champion Hurdle. I see no need to pin my colours to any mast at this present juncture. I’ll make my mind up closer to the time when we have all the evidence and form in front of us and we know the exact make-up of the race and conditions at play; pretty much how I view all races. As such I’m able to view each and every warm-up race objectively. To me this was a perfectly adequate warm-up and final brick in the wall primer for The New One. He was comfortably on top in the end, on conditions that didn’t suit him against an up and coming horse that he was giving 8lbs to. It was job done and all eyes forward facing to the Festival. The New One is still a major Champion Hurdle player, his supporters shouldn’t be put off by this run. Well, I may be in a corner by myself but I thought The New One was impressive! Coped with the ground, despite the naysayers, and won by staying on really well. He coped with the ground OK but I don’t think he was ever really comfortable. Did what he gad to do though and they’ve now plenty time to build him up for the big one at home. Bearing in mind what you say about the current market leaders in the QMCC, it might pay to consider some likely Irish contenders. De Bromhead is likely to have a decent 2 miler or two. The problem with opposing the front three is finding something solid in-behind them. I don’t think, at the minute, the Irish have a really strong contender in their ranks. There are a few ‘interesting’ ones from that side of the Irish Sea but not a great many that you could say had outstanding chances.